Can you see Jupiter's storm? Because of Jupiter's 9h56m rotational period, it's only visible for about 50-minutes each rotation, so you have to hit it just right to see it. Officially called the Great Red Spot, decades ago it was blood red, but today it is a pale pink and more challenging to see. An anticyclonic storm, the spot resides in Jupiter's "bottom stripe"...officially...the South Equatorial Belt. It has been well observed since 1831 and prossibly observed since the mid-1600's. At low power in my scope it looks like a break in the bottom stripe. At high power it's a small, pink oval. Aren't you excited about the 12/21/12 alignment of the planets? professional astronomers are unaware of any special "energy" emanating from the galactic center, the blocking of which will be catastrophic. The second 12/21/12 doomsday scenario has to do with the Maya calendar. (Note: Maya is the civilization, while Mayan is their language.) The Maya's Long Count calendar runs for 5,125 years, after which it resets to zero and begins again. There is no evidence that the Maya's themselves predicted any sort of major event on 12/21/12 (the Gregorian calendar conversion of their date). According to Maya scholar, Sandra Noble (Fdn. for the Advancement of Maya Studies), "For the Maya it was a huge celebration to make it to the end of a whole cycle." To render 12/21/12 (the Gregorian calendar conversion) as a doomsday is "a complete fabrication and chance for a lot of people to cash in." The 12/21/12 doomsday predictions are simply a reinvented Y2K scenario. When I look through Herman's telescope, is it really a planet I'm seeing, or a slide? Yes, that's really a planet, or the Moon, or the sun you're looking at in real time. Rigging a telescope to show a slide would probably damage it. I thought you could only see celestial objects on TV where they use huge telescopes or spacecraft to film them. Nope. You can see (obviously) the Sun and Moon with the naked eye, and (not so obviuosly) Mars, Venus and Jupiter from your backyard if you know where to look (they look like bright "stars"). Some of the brightest "stars" you see in the evening are probably planets. You can also see our Milky Way galaxy on a clear night if you get away from the city lights. Other galaxies are also visible but very faint. How often does Herman set up his telescope for the public to see? Since 1987 Herman has set up his telescope in various places in the city 2006 times as of August 6, 2010. Herman only sets-up on clear eveniings and nights. Herman's web site is too big for my screen. This web site is best viewed with a screen resolution of 1152 x 864 pixels. When I rub my mouse over a planet, the information that pops up is too big for my screen. Move your mouse slightly up and down to see the rest of the info. How much did that telescope cost? $1,300 ih 1981 when I bought it. Today it would be around $2500 with the same optics but with a lot of computerization mine doesn’t have. Can you see the flag on the Moon? Don’t I wish - Then I’d “charge” $2/look! But, no, the smallest object even the Hubble can see on the Moon is about 225’ across, and the flag is probably only a few feet wide. Next time they go to the Moon, if they take a flag about a mile on each side and lay it flat, we might see it with my telescope. How far can you see with your telescope? Under a really dark sky my telescope can see objects as faint as 13th magnitude. At magnitude 12.7, Quasar 30 273 in Virgo is about 1.9 billion light years away. If I could spot it, my telescope can see at least that far. My interest in astronomy started in 1946 in Miss Audrey Wicker’s 8th grade general science class at Garrison Junior High. I’ve been doing “street” telescoping since Nov. 13, 1987. I believe that everybody in the world deserves to enjoy the Moon or a planet up close in a telescope at least once in their life, and I’m doing what I can to achieve tha ideal. Do you believe we really landed on the Moon? Yes, because it would have been harder to fake it than to do it. And if they were going to fake it, why did they go six times? Wouldn’t one time have been enough? Besides, if they faked it the Russians would have called their bluff! Did you make that telescope yourself? No, just the cardboard tube on the end. It’s a factory made, Meade 8” Schmidt-Cassegrain reflector design, a popular model with backyard astronomers. I bought it to use in my backyard, never dreaming I'd bring it to Fell's Point or Harborplace. Happily, it's the right one for those venues, too; the way it's configured, anybody, short or tall, can reach the eyepiece. Is that the real (Saturn)? I don’t believe it! If it looks fake, it’s in good focus! Nature puts on an incredible show! How come I don’t see any stars with it (Saturn)? If you look hard you’ll see one somewhere off the end of the ring, which is Titan, Saturn’s largest moon. Otherwise it’s because of light pollution that we usuaiiy don’t see badkground stars in the city. From a real dark place in the country - yes -, it would look like a tiny, dim “star” among many other tiny, dim stars. I’ve never seen it, because I’ve never tried. Do you believe in astrological “signs”? No. Before telescopes, most astronomers were astrologers, and vice versa. With the invention of telescopes in 1602, they parted ways. Astrologers remain interested in how the stars effect our health, wealth and love lives, Astronomers are interested in how far the stars and planets are, how hot they are, how old they are, what makes them shine, etc. One of the last astronomer/ astrologers was Johanne Kepler (1571—1630), discoverer of the three laws of planetary motion. What’s that bright star that always follows the Moon? The stars and planets seem to stay put from night to night (even though they are moving, too, as we revolve around the Sun, while the Moon traverses the whole sky every 29.5 days, Sometimes the Moon (sky’s 2nd brightest object) will spend 2-3 days near Venus (sky’s 3rd brightest object), causing some to think bright Venus follows the Moon. How do you know what there is to see? I get two monthly astronomy magazines; ASTRONOMY and SKY & TELESCOPE which feature monthly planets and star charts. The Moon appears monthly and the planets appear seasonally. What kind of telescope do you recommend? For starters, a 6” or 8” Newtonian "reflector" telescope. If you will be the only user, consider a simple, “Dobsonian” mount for it. If you plan to have lots of lookers or to do astrophotography, you’ll need an "equatorial" mount with a tracking system. Check the ads in the above magazines. Plan to spend $300 minimum. Less expensive telescopes are sold by many department stores. While optically not too bad, often they have very flimsy mounts which make them frustratingly difficult to aim. It's better to take your time and get a scope from an ad in ASTRONOMY or SKY & TELESCOPE magazines. There are plenty of telescopes offered online, as well. Look for an outlet in your area. 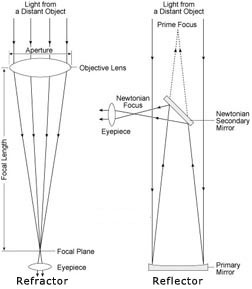 Differentiating between "refractor" and "reflecting" telescopes. Can anybody but God have made that (after looking at Saturn)? I take the 5th amendment. Why do I sometimes see the Moon in the daytime? The Earth rotates every 24 hours, bringing us sunlight followed by dark followed by sunlight, etc. All the while the Moon is orbiting above the spinning Earth (avg. distance of 237,000 miles) every 27-1/3rd days. During that period, when it is over our daylight side we can see it in the daytime. But as it swings around to the far side of the Earth from the Sun (our night side) we start seeing it more at night than in the day. Actually, it is up as much in the day as night, but the bright daytime sky usually makes it hard to notice. And no, the part of the Moon which looks dark at night is not because the Earth is blocking the Sun's light. It is because the Moon is being side lit by the Sun. It's the same as if you hold a tennis ball at arm's length and shine a flashlight on it from the side. Try it! I'd love to. I've seen lots of very pretty things (like Saturn's rings! ), but no UFO's. Anyhow, around the world there are 10,000 professional and 200,000 amateur astronomers scanning the entire sky day and night with equipment working in every frequency from gamma rays to radio waves, and NONE have ever reported seeing a "UFO". They discover quasars, pulsars, planets orbiting other stars, colliding galaxies, comets, and a lot more, but no "UFO's"! 90% of the public's UFO sightings turn out to be the planet Venus. Jupiter has nine moons, right? 155 miles wide, was discovered in 1892 with the Naval Observatory's 26" telescope. The four big ones were discovered in 1610 by Galileo. We know them as Io, Europa, Ganymede, and Callisto - or acrostically, "I Eat Gram Crackers." Io is the most volcanically active body in the solar system. Europa is thought to have an ice covered, watery ocean, a place where, who knows, there may be life. In the telescope, Ganymede is the brightest, Callisto the dimmest, while Io and Europe look the same. Because they orbit Jupiter so rapidly, every night we see them in different positions. Sometimes one or two briefly disappear behind Jupiter or directly in front of it. Always, they put on a great show! Can you see Jupiter's "storm"? We can see it in my scope. However, but because of Jupiter's rapid rotation (every 9h50m...at its equator it's moving in front of us at 28,273 mph! ), it can be seen for only about 45 minutes each rotation - meaning you have to hit it just right. Another problem is that over the years it has shrunk and grown paler. It is no longer the big, blood red color spot it once was. Officially dubbed the Great Red Spot (GRS), it is a rotating cyclone which has been raging in Jupiter's atmosphere for at least 300 years. One explanation for its longevity is that there's no land beneath it to slow it down. It is driven by Jupiter's internal heat. Size-wise, even now it could hold 2-3 Earth's. It's reddish brown hue is believe caused by a mixture of phosphorous and complex organic compounds.